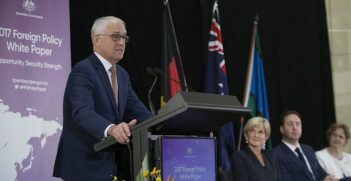 Australian aid is at its lowest level since the 1970s, but geostrategic interests mean Australia remains the largest donor in the Pacific region. How is Australia’s aid achieving its objective of increasing economic growth at the same time as reducing poverty, and whose national interest is being served? The global aid landscape is influenced by two main trends: (1) the United Nations recommendation that developed states give 0.7 per cent of their gross national income (GNI) as aid; and (2) the Aid for Trade agenda. Here, we examine these trends with respect to Australian aid toward Pacific island countries (PICs), emphasising the neoliberal logic that has shaped aid delivery since the 1980s. Several European states—the UK, the Netherlands, Denmark, Luxembourg, Norway and Sweden—are funding overseas development aid at or above the UN suggested level of 0.7 per cent GNI. Both Sweden and Norway give over 1 per cent of their GNI as aid. In contrast, Australian aid as a percentage of GNI is now at its lowest level since the 1970s. Australian aid is around 0.22 per cent of GNI, making Australia the equal-nineteenth most generous donor of the 35 OECD member states (on 2015 figures), and the twelfth most generous in real terms. This is largely due to the $1 billion cut from the aid budget in 2014-15, and smaller subsequent cuts. The 2016-17 budget allocated $3.8 billion to foreign aid, down $191 million (6 per cent) from the 2015-16 budget. The aid budget has a bilateral component of direct country funding, along with a figure that represents the individual country’s share of regional cross-cutting development objectives including, empowering women and girls; economic growth and private sector development; promotion of healthy and resilient communities; fisheries assistance; education; and effective regional institutions. 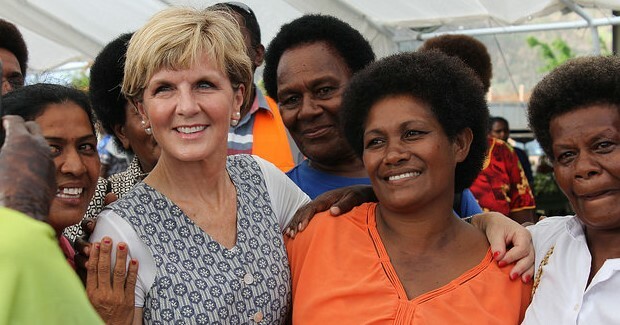 The Indo-Pacific region remains the focus of the Australian aid program. In 2016-17, the Pacific region will receive $910 million, Southeast Asia $657 million, South and West Asia $217 million, and Africa $52 million. Aid funding to Papua New Guinea is around half of all aid to the Pacific region, while aid figures for other PICs are unchanged from the previous year with the exception of Fiji, which received humanitarian support following cyclone Winston in February 2016. Pacific regional programs will receive $149.8 million. Australia’s national interests in the Pacific are principally geostrategic rather than trade based: maintain stability in the “Arc of Responsibility”; minimise Chinese influence through strategic denial; and keep offshore detention centres open. Australia remains the principal aid donor to the Pacific, well ahead of both the United States and China. Between 2006 and 2013, Australia provided around $6.8 billion to PICs, the US $1.7 billion, and China around $1.5 billion. Since the $5.7 billion Australian aid budget of 2012-13, the largest cuts have been to Southeast Asia, down 51.9 per cent, while cuts to the Pacific have been more modest, down around 25 per cent. While the Regional Assistance Mission to Solomon Islands (RAMSI) will be concluding in 2017, the Australian Federal Police is likely to continue providing policing support although in a bilateral mission. Australian aid policy has adopted neoliberal economic principles of market-led development. As part of the efficiency push in the aid sector in the 1980s, budgetary aid (block grants) gave way to tied aid, while the 1990s saw the contracting out of aid service delivery to the private sector and NGOs. By the early 2000s, Australian companies received between 80-90 per cent of the aid budget, a phenomenon known in the Pacific as “boomerang aid”. By the late 2000s, Australian aid was linked to the Millennium Development Goals (MDGs) which enabled tighter control of bilateral aid spending as tranche payments were released only on the achievement of key performance indicators. Under the Aid for Trade agenda initiated by the World Trade Organization in 2005, aid recipient states are encouraged to balance their budgets, reduce public sector spending, and exploit their comparative advantage in the global marketplace to seize export opportunities. Australia has embraced Aid for Trade and Minister for Foreign Affairs Julie Bishop has stated that by 2020 one-fifth of Australia’s aid budget will be “aid for trade investments to support developing countries to improve their regulatory environments, enhance their economic infrastructure and build their private sector capacity.” Australia aspires to global leadership in promoting and supporting aid for trade investments. The private sector is regarded as integral to fostering growth and development in PICs, so regional free trade agreements such as the Pacific Agreement on Close Economic Relations (PACER)—negotiations for which commenced in 2009 and are known as PACER Plus—are viewed as a key mechanism to enable economic growth. The role of aid donors is to facilitate private investment by promoting public sector accountability and good governance in PICs, as well as providing key infrastructure projects such as wharves, jetties, roads and market houses to eliminate bottlenecks in production. Funding for regional and cross-cutting programs promotes the involvement of the women in the market, upskilling in financial literacy and technological transfer from the private sector to PICs. Cuts to the aid budget raise the issue of how a decline in Australian aid spending will achieve the objectives of increasing economic growth and reducing poverty in the region. While this may appear counter-intuitive, current policy aligns with the UN Sustainable Development Goals, particularly goal 17, which sees development partnerships, not traditional donor aid, as the mechanism to achieve economic growth and raise people from poverty. Government, business and civil society will together “drive sustainable growth and reduce poverty in our region”. PICs also want development, but questions remain as to whose national interests are best served by the Aid for Trade approach. Dr Nichole Georgeou is a senior lecturer in Humanitarian and Development Studies at the Western Sydney University. Dr Charles Hawksley is senior lecturer in Politics and discipline leader, Politics and International Studies at the University of Wollongong, New South Wales. This article is published under a Creative Commons Licence and may be republished with attribution. 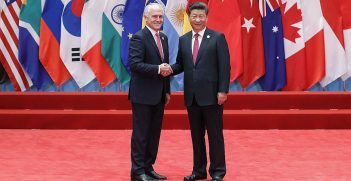 The recalibration of Australia-China relations is instructive for other countries seeking to respond to the more assertive and coercive elements of Chinese foreign policy. The new Foreign Policy White Paper is thoughtful and likely to last. It is marred by the familiar idea that diplomacy happens effortlessly and Australia's future international relations require no additional resources.